Glasgow-based performer and choreographer Claire Cunningham is Artist in Residence at PIAF 2016. What do I want the participants to get from the time? Connection – to each other. Friendships. Trust. Possible collaborations and allies for the future. Realization they are not alone. 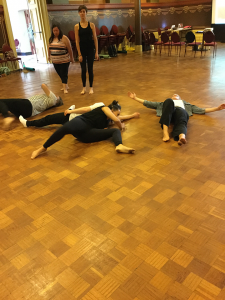 New ideas to try, ways of thinking about performing, noticing and language. Time. Taking time. Permission to take time. Permission to look and be looked at. Permission to be listened to. 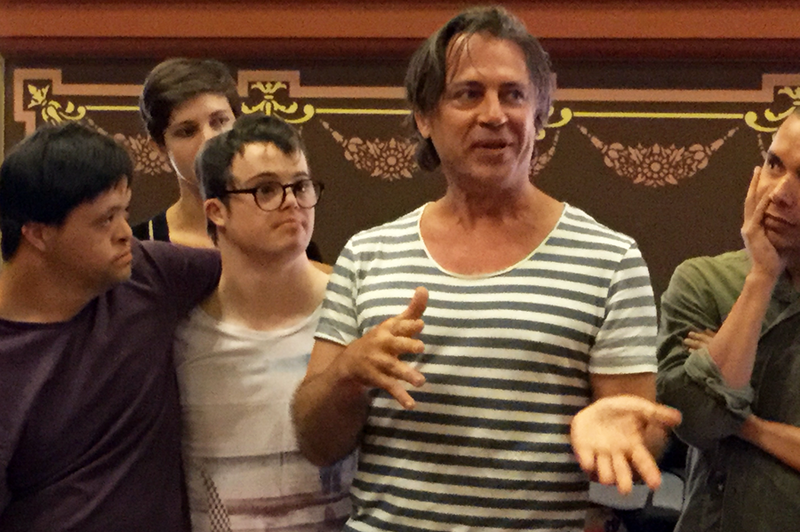 Giving them permission to speak, to give voice, to say ‘that’s enough’, to communicate. What is my offering to the group? 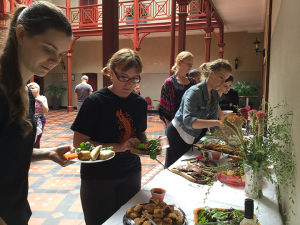 A space to share knowledge and experience, to learn about each other and each others work. To share the things I love, the tasks that have made me think, made me squirm, made me know that I needed to do them again because they made me uncomfortable. 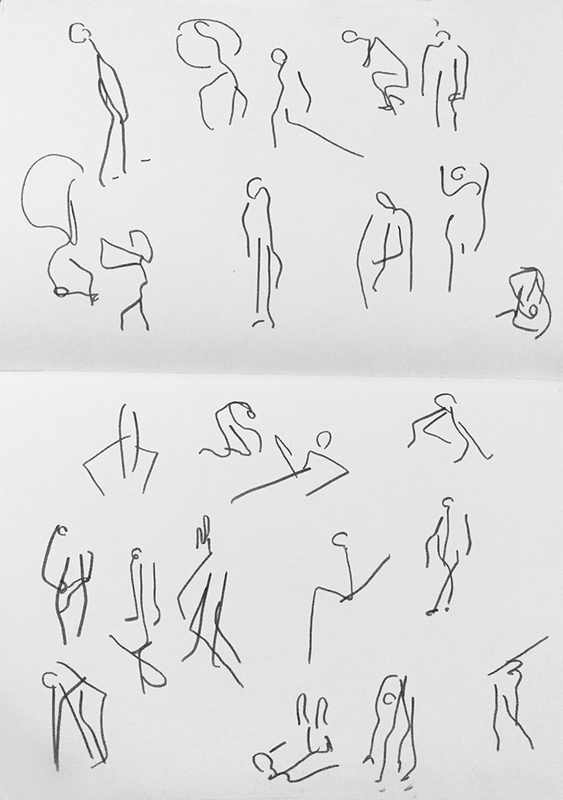 The exercises that made me notice – my habits, the way I move, the way I think about moving, the way I think about my body, the language I use, the importance of language. I’m just back from a week residency in the Tasdance studio where I had time to reflect on the processes shared with us by Claire Cunningham. 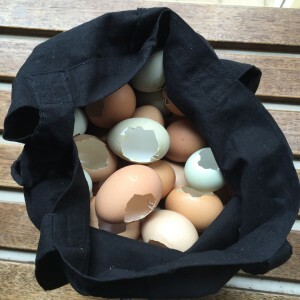 During the week I worked with 250 egg shells ( a few were seen in a short interview that features on the blog from Feb 24). 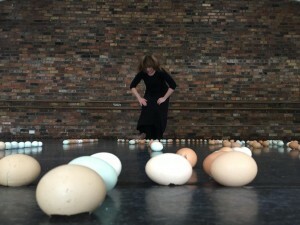 These egg shells were flown from Denmark, WA to Launceston, TAS. They mostly survived the journey and became powerful tools to use in my research into visual balance, repetition and disruption. 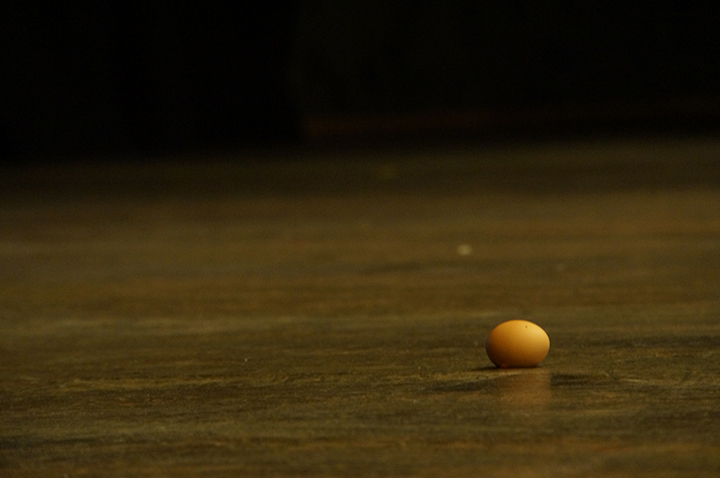 Last week I performed a solo that encompassed this research for a small gathering at the Tasdance studio. In November I’ll share this research with my home community of Denmark via four more solo performances for Brave New Works Festival. I was an actress in a play Black is the Colour, which also was part of the Melbourne Fringe Festival. It’s the first production by Deafferent Theatre and a two Deaf-women play and performed entirely in Auslan with English subtitles. 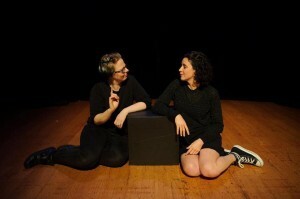 An Australian play written by Daniel Keene, it is about friendship, with at times hazy boundaries, between two women. 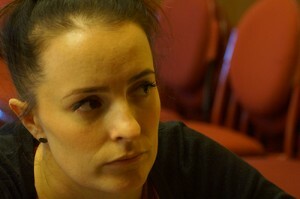 Director Jess Moody said “Relationships are forged and lost through language. Tonight I put the language of survivors, of the Deaf community, and of women on the stage.” It was an extremely satisfying project to do as it gave me the opportunity to try out a new art-form (acting) working with people I have never worked with before and tackling complex themes such as domestic violence, loss, grief and memory especially seeing the statistics of Deaf survivors of domestic violence are alarmingly high. I have two upcoming projects; dancing in a silent film directed by dancer/film-maker Jacob Edwards and a performance art project with Nicola Gunn. Nicola Gunn is a Melbourne-based performer, writer, director and dramaturg. 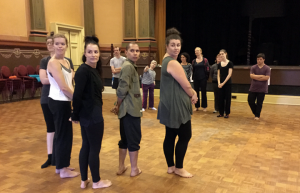 This project, The Interpreters, will be performed in English, French, Auslan and Bunwurrung against the backdrop of a French Mansion in Melbourne. 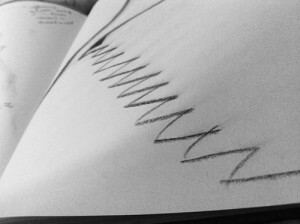 This is a work about the act of interpreting, about changing words into meaning and back again. It has been a very enriching year and I feel so lucky (and exhausted!). 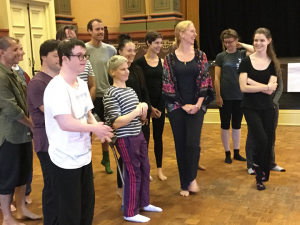 I hope there will be more opportunities like Claire Cunningham’s workshops as they are so important for artists at different stages in their career to do. 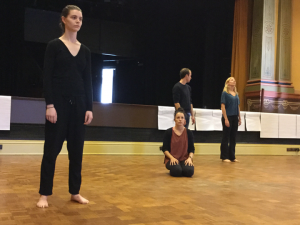 Drumroll……I made my first choreographic work this year! 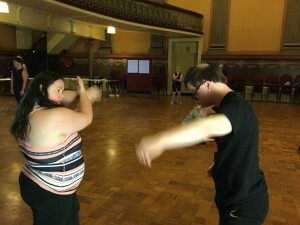 Through the Melbourne Fringe’s COMPASS mentoring program, I choreographed a dance piece called Distraction Society for the Melbourne Fringe in September. 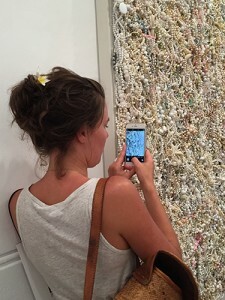 Using Banksy’s graffiti artwork Mobile Lovers as a reference point, Distraction Society is a highly visual and physical dance work which examines the forces of attraction, attention and distraction in relationships. As a choreographer, I wanted to create a piece that was very physical and visual with no spoken text as I wanted to make this accessible for as many people as possible and make it something that almost everyone regardless of age and background can relate to i.e. that we now live in the Age of Distraction where we all are expected to participate in. Things evolved very quickly and what are the consequences for us? 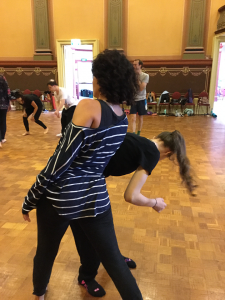 I created a series of duets with my collaborator Amanda Lever, exploring giving attention to the distraction, the attraction of distraction and using distraction as focus. 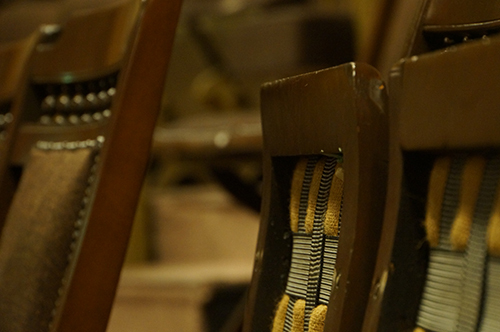 It was a successful season with full houses each show and positive reviews. I was paired up with a mentor, Vanessa Pigrum who is the Executive Director of Chunky Move. 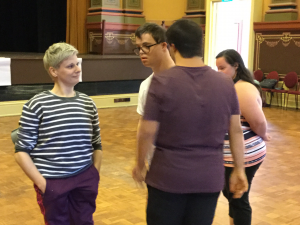 Only one week after Under My Skin finished, I went straight into another project with KAGE (a dance and physical theatre company based in Melbourne) for the second development of Out of Earshot which will premiere in 2017. I worked with three other dancers (Gerard Van Dyck, Elle Evangelista and Tim Ohl), and with drummer Myele Manzanza, under the direction of Kate Denborough. 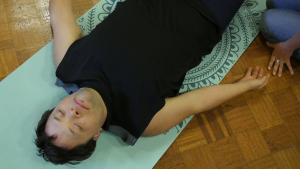 This work explores how everyone experiences sound, rhythm and silence differently. Sound isn’t something that is exclusive to hearing people. It’s something everyone and anyone can experience may it be through the ears or the body or as an insight. The same applies to silence. Silence is a sound and it has substance. It’s not an absence or emptiness. Again Claire’s workshop really helped me personally in this project. Sometimes I feel uncomfortable about whether I am being hired for my artistic skills or the fact I am Deaf. 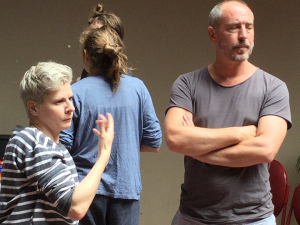 Even though Kate is an intelligent and sensitive choreographer, I had to steer the focus from ME and DEAFNESS to the other dancers and OUR individual and collective perspectives and experiences on sound and rhythm. I’ve had a busy but fantastic year. 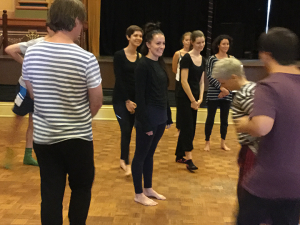 I am so grateful for starting off the year with a week in beautiful and warm Fremantle doing an intensive with Claire Cunningham. It really changed the way I think about my work, and myself as an artist. 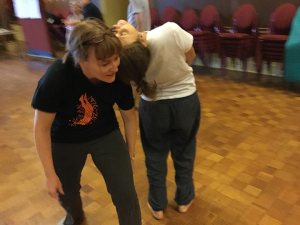 Claire gave e the confidence to reclaim my voice and not to feel like I have to oblige with the generally-accepted idea of what dance is and who can be a dancer. That confidence infiltered into all of my dance projects this year. It has been very positive and empowering. 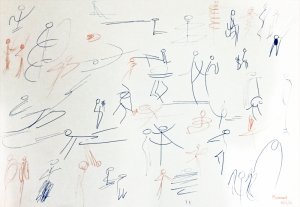 I often revisit Claire’s workshop materials and insights to help guide my artistic practice. 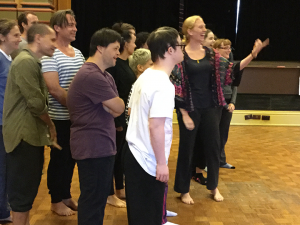 Not long after the intensive with Claire, it was straight into rehearsals for Under My Skin with The Delta Project. 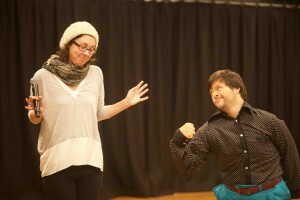 I co-founde The Delta Project in 2012 with Jo Dunbar, Deaf choreographer from the UK. 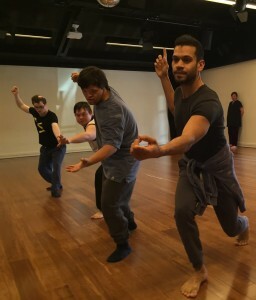 The Delta Project is a Melbourne-based dance company employing Deaf and hearing dancers. 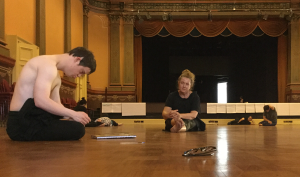 The Delta Project has had two collaborations; Collisions in 2012 with Jodie Farrugia and Jo Dunbar and Under My Skin in 2014 & 2016 with Lina Limosani (DT) and Jo Dunbar. 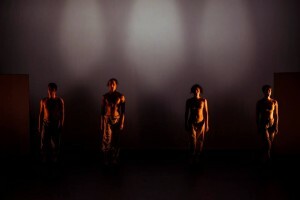 Under My Skin was performed at Next Wave Festival at the Arts House in North Melbourne and was a very successful season. We worked with media artist Rhian Hinkley and sound designer Russell Goldsmith who created images and sound merging access into the aesthetic design. 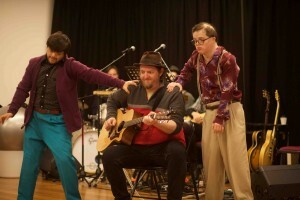 They made sound visual for the Deaf performers and audiences. Goldsmith created sound that can be felt rather than heard which appeals to the body rather than the eardrum. 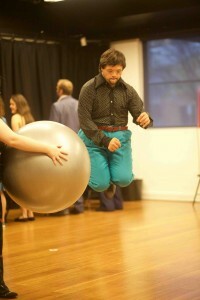 I’ve also performed in the Adelaide Cabaret Festival with Restless Dance Theatre’s In The Balance with The Audreys! Joshua C – I’ve been busy! 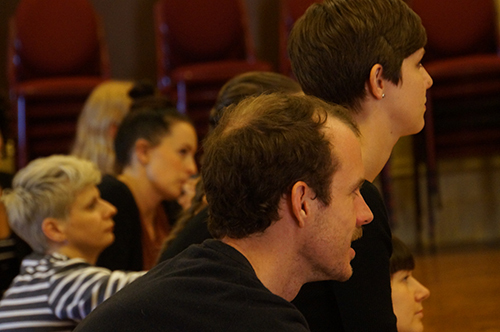 Claire Cunningham, Joshua C, Post workshop update Comments Off on Joshua C – I’ve been busy! Since Claire Cunningham’s workshops I have been VERY BUSY! 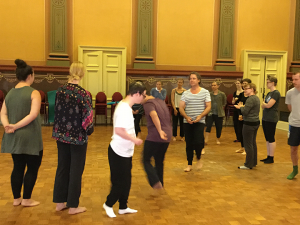 I have participated in workshops with Frantic Assembly at Restless Dance. 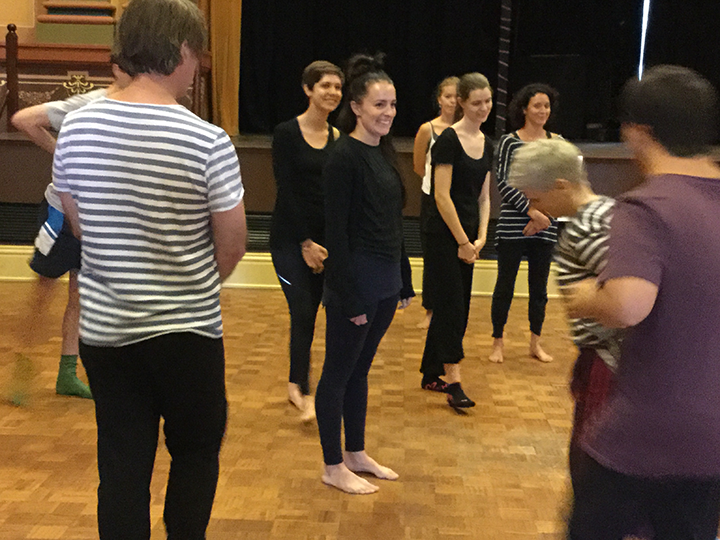 I attended the 2nd Catalyst Dance residency in Sydney last month, and am looking towards doing more work with some of the other Catalyst participants next year. 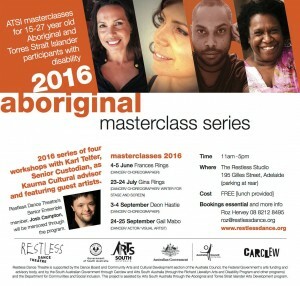 I am attaching the flyer for the Aboriginal masterclasses I’ve been doing. I also did a beautiful performance at Restless with one of the Aboriginal masterclasses I was part of, working with Dion Hastie. 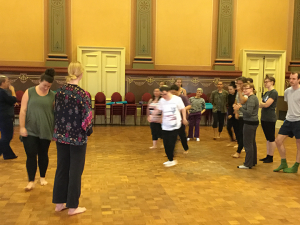 I am being mentored and am assisting as a tutor for the masterclasses – there have been three so far and I have been mentored by Gina Rings, Francis Rings and Dion Hastie, with a final workshop coming up with Gail Mabo 24th/25th September. 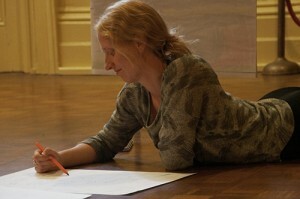 I am currently working on directing a piece for Restless Dance’s Debut 5 series and my mentor is Gina Rings. The piece is called What Bird is That and is inspired by Australian birds in the bush. I am also dancing in a piece that another member of Restless Dance is directing. I am looking forward to the premiere of a film I acted in last year, Maurice’s Symphony. My dance film, The Landscape Diaries, is behind schedule, as the winter here has been unusually wet, and filming is outdoors. The film’s producer, from Tutti Arts, is now overseas and will be back in October when work on this project will recommence. Next week I am attending a three day workshop at Flinders University for ATSI actors. I love dance when I hear music and the sound of my beat box. Dance is fantastic new ways of moving. When I dance I feel free. When I move I feel creative. I love dance SO MUCH and keep on dancing. Take a space in the room and make a statement. If you can relate to that statement then go stand with the person. Take a moment to look at the group you are in/not in. the constellations….the differences…the similarities. The unexpected allies…. in the gorgeous inner courtyard, with delicious food provided by Claire Cranny and team. Peripheral Fluctuation. 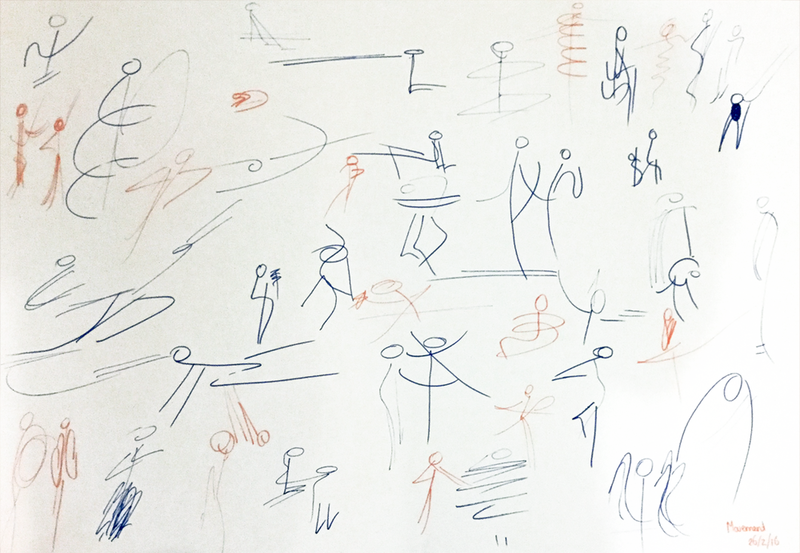 To notice how we see/ what we notice – hierarchy of sight, range of periphery and of movement. 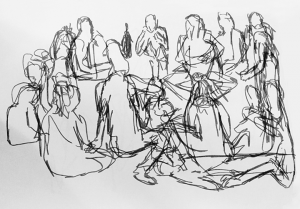 Pick a person in the room and try to keep them only in your peripheral vision and not in your fauvial vision (central). Today I learned to use parallelavision and movement. I have fun to meet new people I would like to know better during in this week and in the future. I never listen but today I did. First time for me and to Claire Cuningham…thank you for this biggest opportunity to see all new faces I haven’t seen so thank you. 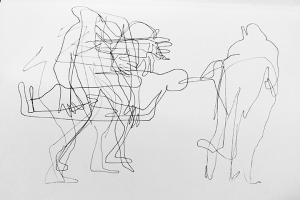 We are doing free writing for five minutes but all I have are drawing pens, I am not sure how vulnerable I feel and maybe this means I need to go to classes more or figure out a medium of which I can interrogate myself genuinely but I also feel unartistic and strange out of body quite uncomfy in my own skin. Maybe I don’t feel too awful but I think this might not be right for me right now or it could be perfect but I can’t be sure either way to be honest. Not sure how I feel, existential loss and worry that my life will be over someday is terrifying. These were three things Claire wanted us to achieve or make (there were a lot more details surrounding those three things – questions, routines and ideas that I won’t go into today). 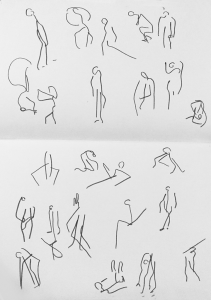 But to achieve those three things of connection, time and space this week I know that I have to commit to being vulnerable in the rehearsal/workshop space. 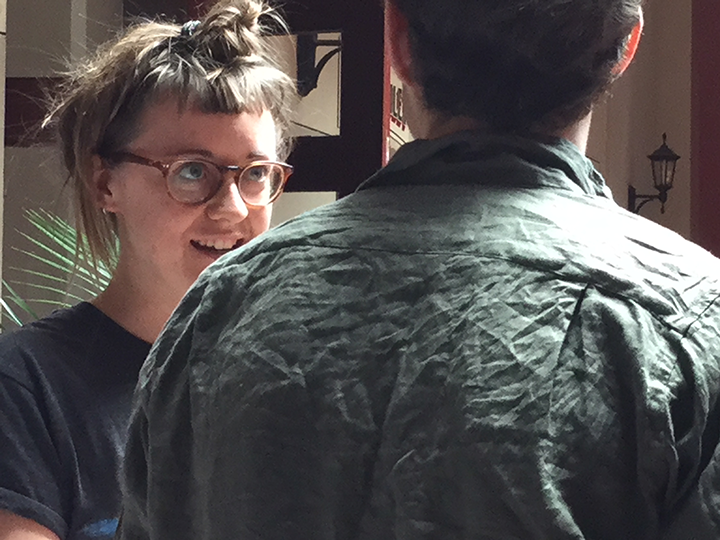 By being vulnerable I open myself up to making connection with Claire and the other participants to the space and to the works. By being vulnerable, I can take the time needed for whatever we are doing, and finally, by being vulnerable, I can create, play, manipulate and use the space (with and without others) to be inspired, upskilled and ready to roll, no matter what the next four days may bring. I looked around and felt out of the moment, out of myself and out of tune, but in an instant of refocused commitment to the task I was brought back to myself. I’ve had a difficult time just being me lately, remembering who I am, what makes me me and why I do what I do. Have I lost my purpose, my way of connecting to myself, to other people around me, to the people I love and trust and I wonder…is it that I’ve stopped trusting myself, trusting as I have done for most of my adult life that everything is on track and everything is totally okay or… have I just taken a back seat in what I feel I’ve been put on this place to do, what I’m meant to do, how I’m meant to give to and connect with other people? I have been taught some beautiful exercises which I will carry with me and I know I will use again. Things that make me think, made me react, made me discover. 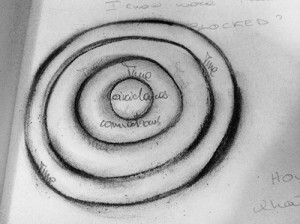 Exercises that taught me to leave time and space as well as the idea of self reflection in a group (a paradox I know, but a good one). The question that stuck with me the most after today was when Claire asked “Do YOU – you not anyone else – identify as disabled”. And even though I have been asked that question before I don’t think I have ever thought about it properly, with there being no consequence for my answer. Normally you are asked that question when you fill out a form, are ticking boxes, doing an application, you answer it to get a specific response from another person. To genuinely just be asked the question “do you identify as disabled?” was difficult and I still don’t know the answer, but will be something I ponder in the week. Is identity forever? Can I identify with something one moment and let it go the other? Am I ok with others potentially judging that association? 360° offers a whole possibility of coming out and going in. It creates space. Repetition, repetition, exhaustion, find the limit.. that is where the stuff is. Travel across the space. No movement is without description. Minimize your movement as necessary. 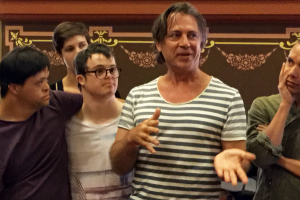 I stand/I stand on my feet/ I stand on the floor/ I stand on a wooden floor/ I stand in the Town Hall/ I stand in Freemantle/ I stand in Western Australia/ I stand in Australia/ I stand on the Earth…..all are valid interpretations of the same act. Remember all the sounds you can make with your voice and mouth (eg consonants, lips, etc). Creating a strange soundtrack to your movment, but with more freedom and play than Say what you do. 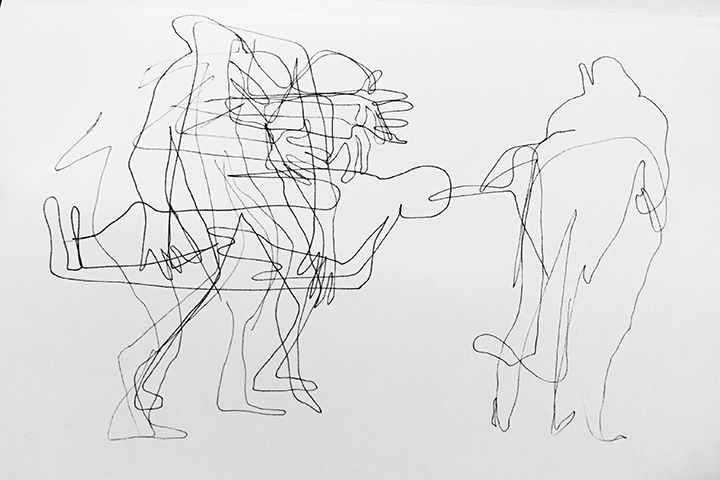 This exercise was my favourite thing I did today. I have done something similar before and actually hated it, but today I loved it. 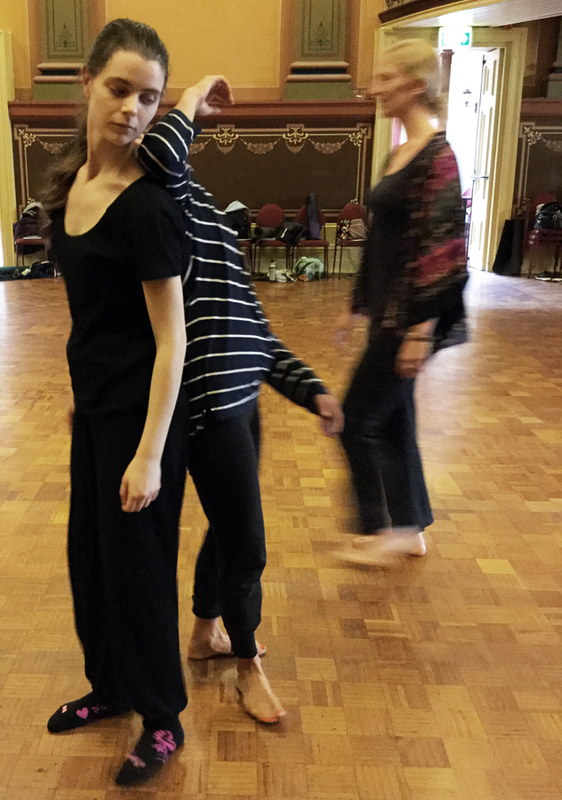 Swapping between 3 different things describing your movement, moving with the breath or moving with sound. After some exploration we were set to work in pairs. Philip and I worked together, having only met yesterday and not yet really having done anything together or even a conversation over lunch. Yet it was the most connected duo. There was clarity of movement. It was impulsive. It was easy to listen to each other (because we were listening to both movement and sound). 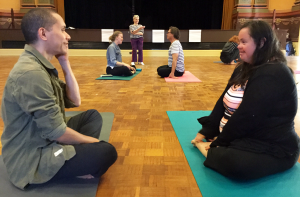 There was clear communication between us (by simply talking/making sounds as we danced). 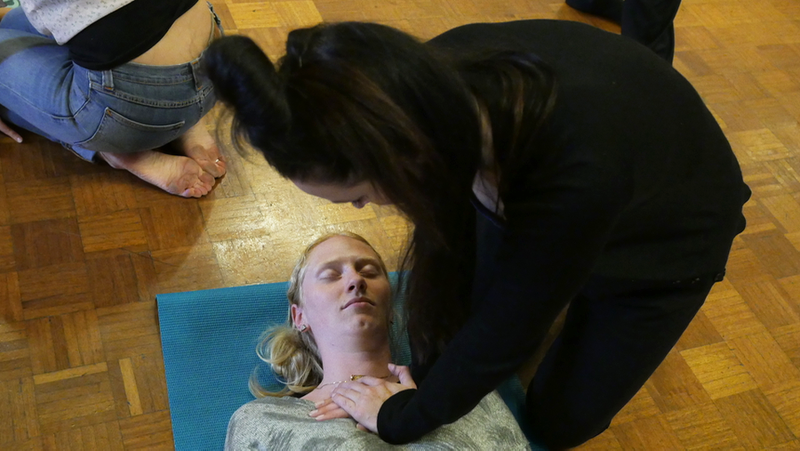 Especially today I have really appreciated not only getting to work with the inspiration that is Claire, but also all the other participants in the workshop. Getting to know them, watching them, and learning about their projects and practices has been amazing and given me so much to think about. I’m loving how safe the space is. Everyone is so open and receptive and I think that contributes to the atmosphere. In my last journal I talked about three key words that Claire wanted to explore this week. Taking time to watch others be creative. Taking time to make sure Tina understood the activities. Taking time to make sure I was in a vulnerable place (but also safe) to complete the activity to its full capacity. Taking time to feel every movement, to hear sounds and observe my surroundings. Taking time to know how far I can be pushed (mentally and physically) and maybe how some of my limitations are in my head (re: ‘that’s enough’ activity). Taking time to be creatively refreshed, recharged and empowered in my current works. 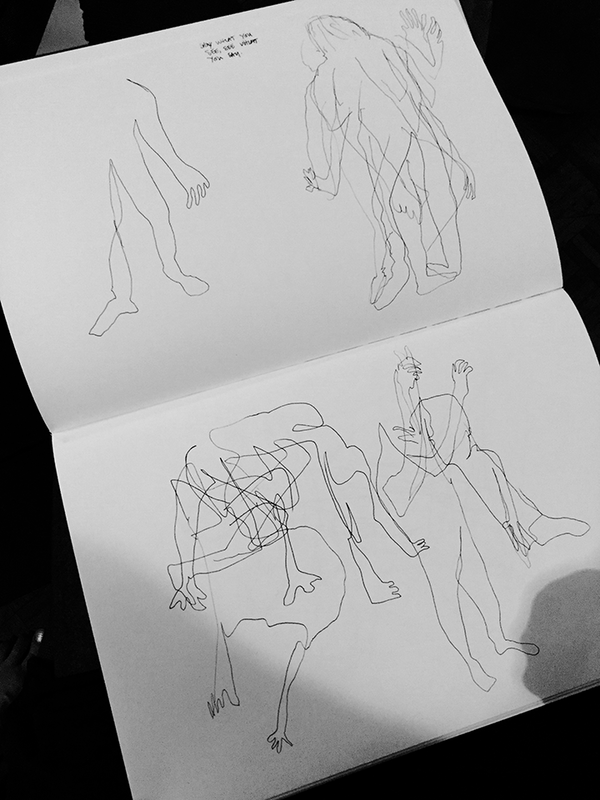 Today I made some movements with breathing and sounds. It was bit weird but I enjoying it. It was fun to be part of it and pressure point it was amazing. I was matched up with William. I feel connected to this person. I was working with Lorcan with moving and sounds and I had fun with him. I really liked doing the movements. 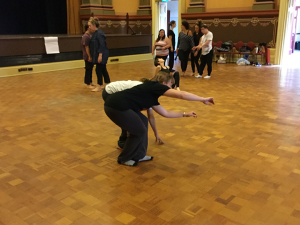 One partner lies on floor, the second partner applies weight to a single point of contact.. dropping weight vertically into the other body not pushing into it. Apply weight incredibly slowly, until the person on floor says “that’s enough” – when they can tolerate that weight but don’t want more. Learn to say it before it is too late. Avoid using hard language like “stop” that creates tension or fear of having done something wrong. Intentions: to learn about another body, how it works, what weight it can take. What your projections are of that body (based on your assumptions or your associations in your own body). This is particularly important when working with non-normative bodies. To learn to take responsibility for your own body. 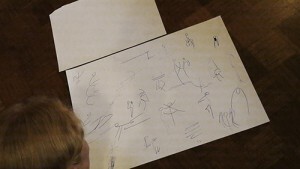 To communicate with other dancers. To trust. To learn that we can talk to the people we work with, especially in dance. Contact Improvisation intentions: To learn how to control giving weight. To learn how to give weight at a speed that the other person has time to read it, to stop it or adjust to it. To learn how to use your and the other persons skeleton to transfer weight through the bodies into the floor. To learn how your body is affected by weight being applied. Where it can/can’t take weight. One partner is “performer” , other is “observer”. 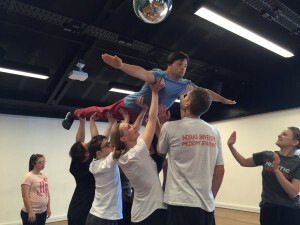 Performer can stand or sit but must remain ‘active’, only moving their eyes. 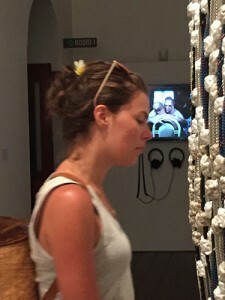 Observer sits in front of performer. The score for the performer is to be ‘present’, or ‘not present’. Add to be present with the space/with your audience/with detail/with another performer. Physical score: sit, stand or walk. Intention: Comfort with being watched. Consideration of being watched/being ‘present’. One person is “performer”, other is “witness”. Score is for the observer to watch the performer for a long period (30mins. 1 hour…hours…) Performer can do anything they want (leave the studio etc). 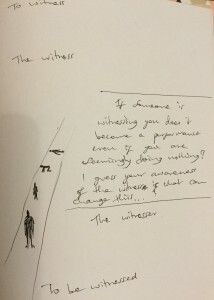 The witness can choose if they want to respond to/interact with the performer. They can also choose not to. The witness is encouraged to observe through different ‘frames’, from different distances, heights, positions. 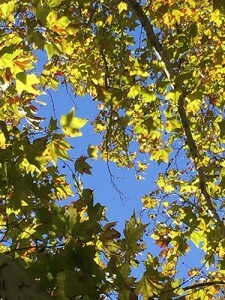 Intention: to consider what it is to give permission to be observed. I thought I knew what that was. I thought I knew where that was going to go. I didn’t. There was something very interesting that happened when I spent a solid 5 mins just connecting with someone. What was interesting was that it seemed to change who was watching and who was performing (even though we had designated roles). It got me thinking about Marina Ambromivic’s The Artist Is Present (for anyone who doesn’t know this piece google it you will thank me later). I remember reading something about The Artist Is Present and Marina describing herself as a mirror to reflect the audience (that may be totally inaccurate but interesting concept all the same). It got me thinking in The Artist is Present who exactly is performing? Who is witnessing? Is there a difference between Marina and her audience? Another quote from somewhere came back to me during this exercise, which was that your eyes are the window to your soul. There is something interesting about eye contact in this exercise. What happens when you close your eyes? Are you more present? With yourself? With the space? With your audience? and Permission. What does eye contact do to the power? What is it to look at someone who is not looking at you? When someone is watching me I feel creative and lost and happy and free. I feel connected and I love making art while someone is watching me. I feel great and strong and powerful and I love it. Time to observe, witness, watch one another and ourselves. Time to ask questions, query, try to solve problems. Time to investigate, delve deeper and find more questions. Time to be present, be fully engaged and committed. Time to practise, repeat and investigate more. Time to reflect, step out of the doing and more into the purpose. Time to be me to remember who I am and why I’m here. 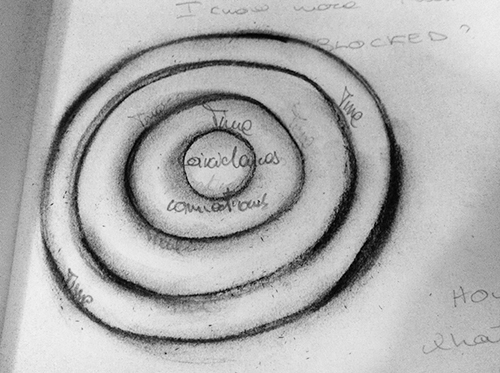 Time…is time the essence of a more deeply engaged practice? 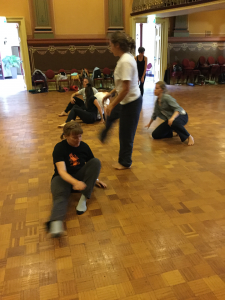 What if everything is choreographed for you….. I found myself in a world of possibilities and coincidences…. 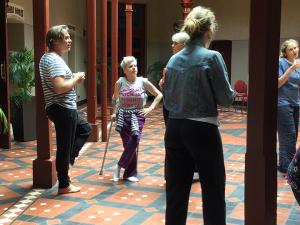 everything all of a sudden seems so fluid..
As we start the day and during our check-in I find myself drawing a massive staircase, which is then totally revealed to me as the curtains open and revealed APOCRIFU set…. inside and outside disappears all of a sudden. As part of my performance I took my watcher Rachel in a tarot reading session today, totally unexpected but it happened… it was a total experience, that couldn’t have been possible without Rachel there…but I was just the total me there, I was Cinzia in a situation where I reacted probably as Cinzia …. was that a performance? Looking at Performance as Experience bring lots of Freedom to me. Annette and Amy: Give Me a Reason..
Amy, Claire Cunningham Comments Off on Annette and Amy: Give Me a Reason.. Please move cursor away from video to read the subtitles under the play bar. Philip & Zoe: Give Me a Reason..
Philip: With just one minute of Tell Me Something You Love with Zoe, she revealed her love for connection, beautiful things such as swimming in the ocean, flowers, textiles, design, art and detail. This was enough inspiration for me to know that a trip to the Fremantle Arts Centre for the Black Sun exhibition by Dani Marti would be a perfect reason to live. We walked in silence and held hands as we crossed the traffic – we took the long way there, but a brisk walk on a beautiful day was just as much part of the journey as was the exhibition itself. The urgency we both had in trying to fit everything in. How Philip picked up on the things that I loved and how he put action to that. Anna and William: Give Me a Reason..
Claire Cunningham, Photos Comments Off on Anna and William: Give Me a Reason..
a portrait, sharing a journal, a massage..
Who is doing the work? Who makes the performance? Am I genuine in answering questions?